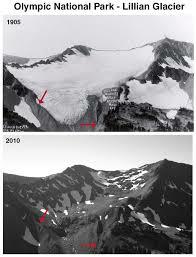 Global warming is causing disappearing glaciers. June 24, 2016—June 30 is the 100th anniversary of the establishment of the National Park Service in the United States. This year attendance in the parks is expected to be the largest ever. Many of the parks are now quite different from what they were when they were established on August 25, 1916. Perhaps none has changed more than Glacier National Park in Montana. Extending from interior Canada south through the United States is a great range of mountains. The mountains were thrust upward 65 million years ago. The rugged mountains and deep canyons that now exist have been created over the long period of time since the mountains were uplifted. The Continental Divide runs along the crest of the mountain chain. From the crest eastward rainfall and snow melt end up in the Atlantic ocean and, west of the crest, water eventually reaches the Pacific Ocean. Part of the mountain system is in Canada, and the southern sections are in the United States. Rapidly melting glaciers of the northwest U.S. In 1895 the Canadian government recognized the unique character of the mountains, creating Waterton National Park in the Province of Alberta. 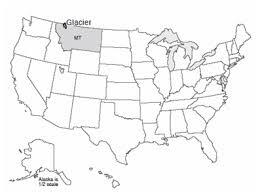 In 1910 the United States responded by creating Glacier National Park in the state of Montana. The park contains about 1400 square miles (3626 square kilometers). Since the two parks occupied part of the same mountain system and the two countries have such a good relationship, they joined the two parks to make the Waterton/Glacier International Peace Park. Glaciers are disappearing in our national parks. The distinguishing characteristics of Glacier National Park are the large number of glaciers that existed inside the park, but the very features for which the park is named, will soon be gone. At the time of its founding, it is estimated there were about 150 separate ice fields. Today there are perhaps 25! At the time the park was established, it was possible to walk a short path to reach a glacier. Now it is a seven mile hike over rough terrain to reach the ice. 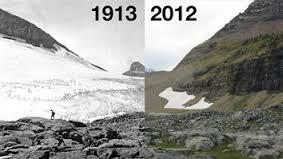 A few years ago it was predicted that by 2050 all of the glaciers may be gone. That forecast date was later moved forward to 2030. Now a study reports the glaciers may be gone by 2020, just four years from now! The demise of the snow and ice is due to the warming climate. The climate of the region has been on a slow warming trend since the end of the last ice age thousands of years ago. However, in the past few decades, the temperature has been rising faster and the ice melting at an accelerated pace. Rising temperatures create earlier snow melt and warmer and drier summers. Today the spring floods from snow melt and the low flows of summer are occurring earlier by several weeks. As temperatures rise more precipitation in spring and fall comes as rain instead of snow. In the summer, temperatures of 90°F are now occurring in July and August. Since the park was established the number of 90 degree days have tripled. Like the rest of the United States, winter temperatures have gotten warmer as well. In the area outside the park, privately owned ski resorts have closed due to the shorter ski season. The changing climate has had a huge impact on the vegetation and wildlife. The forests in the park are being affected in many ways. First, the treeline is moving upward in many areas of the park and there are more forest fires. Next, infestations of pests and diseases attacking the forest are on the increase. Finally, native fish, birds, and other animals are seeing their habitat changed. Many, if not most, other national parks are changing due to global warming. Yellowstone, Mt, Rainier, Rocky Mountain, Redwood, and Joshua Tree are among those also being affected. With the rapid rise in temperatures it is probable that most national parks will see substantial changes. Categories: Climate Change, Extreme weather, Global warming and its effects on animal population | Tags: Climate change, Disappearing Ice Shelves, Glacier National Park | Permalink.